Sunday 1 July 2018 was a wonderful day of faith, celebration and joy in the Catholic Parish of Hastings – Te Pārihi Katorika ki Heretaunga. Tevita Fakaosi was ordained to the permanent diaconate at Mass in the Church of St Peter Chanel. 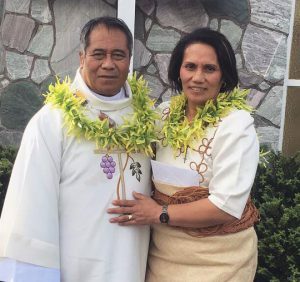 Tevita was surrounded by all his family, the Pasifika community of Hastings, including his own Tongan community, and members of the wider parish and its schools. Bishop Charles Drennan, the ordaining Bishop, was joined by Bishop Peter Cullinane who had initiated Tevita’s journey to the Diaconate, together with many priests, including a Marist cousin of Tevita’s who had come from Samoa. The multicultural aspects of the liturgy reflected the community of Hastings. Students from St John’s College processed the Gospel to the lectern; the altar was clothed in tapa; the uplifting hymns used many languages; and all the clergy were bedecked with lei. Most impressive was the feeling of unity and joy among all gathered ‒ a sure sign of the presence of the Holy Spirit. Tavita was appointed as a cathechist during the 1990s. This galvanised him into sharing his faith experience among Pasifika people through education, spiritual and music programmes at the Aubert Centre in Flaxmere. Tevita surrounded by family and members of the Pasifika community of Hastings. Tavita, also a JP, developed a response to the issue of family violence ‒ a service by Pasifika for Pasifika. He recognised his calling to work with those affected by domestic violence through his background of training for the priesthood for 10 years, then running a business employing seasonal workers in the horticulture sector and raising his family. He has built up a rapport with people from all walks of life. The day of his ordination was completed with a hākari, which brought the community together with food, song and friendship. 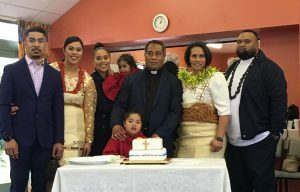 Bishop Charles thanked Ave, Tevita’s wife, and their family for supporting Tevita in his generous response to God’s call to be a man of a sacred service to the people of the Hawke’s Bay.